Gently fry the roughly chopped vegetables in a pan, add the quail bones and the chicken stock, bring to the boil and skim. Lower the heat and leave to cook for about 3 hours. Filter and keep warm. Heat the pasta in a pan, add the saffron and then add the salted water a little at a time, and cook. Take off the heat and stir in the butter, Grana Padano and vinegar, adding salt to taste. Leave the pasta compact and divide it between 4 buttered moulds, pressing gently with a spoon. Keep warm. Bring the water to the boil in a pan, add the vinegar and use a spoon to create a whirl. Pour in the quail eggs (shelled) one by one, lower the heat and cook for about 2 minutes. Use a pasta spoon to scoop out the eggs and stop cooking by immersing them in water and ice. 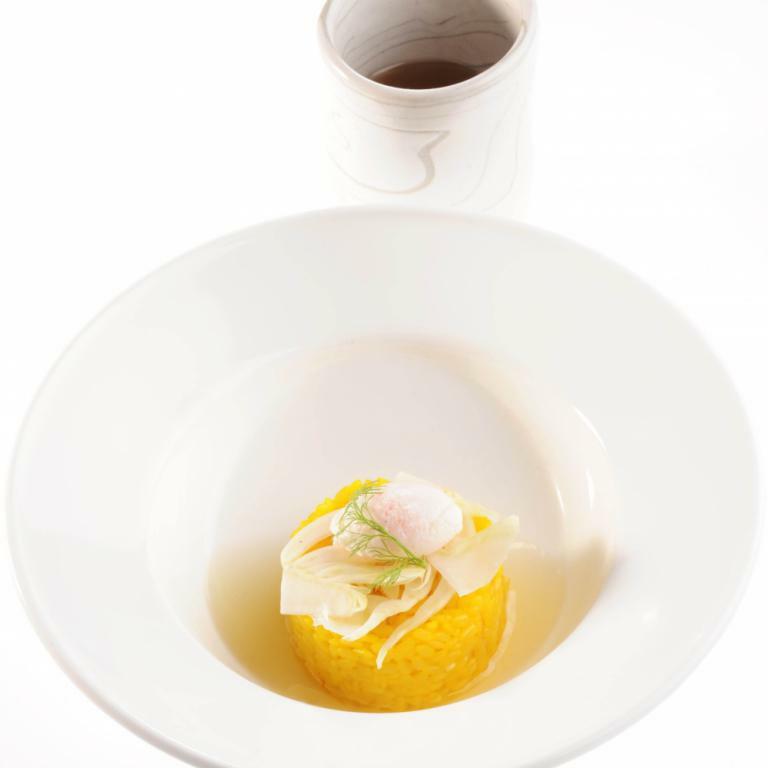 Turn out the pasta timbale, placing a quail egg on top, with the fennel dressed with a little extra virgin oil. End with the Maldon salt and serve with the hot stock.